The Mokelumne (pronounced moo-ka-la-mi), located at the junction of northern, southern and eastern Sierra botanic provinces, is renowned for its incredible diversity. Elevations range from 4,000 feet near Salt Springs reservoir to over 10,380 ft at Round Top Peak in the north. Visitors will immediately notice the variety of rock comprising its mountains and canyons. An important example of “crest zone” geology, the metamorphic rock capping Mokelumne Peak once covered most of the Sierra’s granite. This layer of volcanic rock, sand, and mud can be found here alongside weathered granite as old as the dinosaurs. First protected under the Wilderness Act of 1964, the Mokelumne’s borders were expanded under the California Wilderness Act of 1984. The wilderness takes its name from the Mokelumne River, which was named after a Mi-wok Indian village located on the banks of the river in the Central Valley. The Mokelumne Wilderness spans 105,165 acres that straddles parts of the El Dorado, Stanislaus, and Humboldt-Toiyabe National Forests. 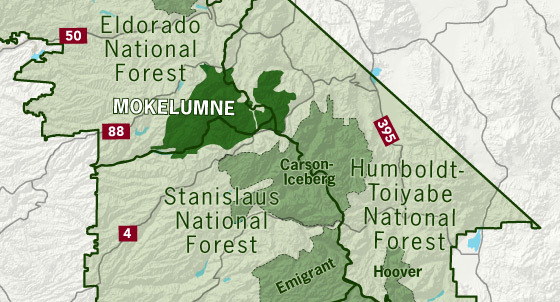 Situated on the crest of the Sierra, spread between three National Forests, the Mokelumne is one of the more accessible wilderness areas in the region. From the north, many visitors enter the wilderness from along Hwy 88 as it crosses Carson Pass. From the east, Markeeville along Hwy 89 is a common point of entry, and from the south Hwy 4 runs along the edge of the Mokelumne as it clears Ebbetts Pass and Bear Valley. During the summer, permits for the Carson Pass Area can only be obtained from the Carson Pass Information Station (located off Highway 88 at Carson Pass, 5 miles East of Kirkwood, CA) on a first come first served basis. The station will be open 7 days a week 8:00 AM to 4:30 PM from Memorial weekend through September. They are available at the Amador Ranger District office the rest of the year, however the info station is the only place you can obtain a designated campsite in the Carson Pass Management Area. Camping in the Carson Pass area is allowed only in designated sites at Winnemucca (three sites), Round Top (six sites), and Fourth of July Lakes (six sites). Snow camping is allowed if there is at least one foot of snow. From the Friday before Memorial Day through Labor Day weekend, an overnight stay limit of two nights for Round Top and Winnemucca Lakes and three nights for Fourth of July Lakes will be in effect. During the summer a $5.00 day use fee is charged at the Carson Pass, Carson Pass overflow, Woods Lake and Meiss trailheads. These passes can be purchased on site. Other types of annual passes accepted during the summer include the Eldorado National Forest and Lake Tahoe Basin Management Unit Parking Pass, the Interagency Pass, the Interagency Senior Pass, and the Interagency Access Pass. During the winter, a Snow Park permit is required, which costs $5.00 for day use or $20 for an annual pass. You can obtain a pass from the OHMVR website or check with the Amador District Office for more information on obtaining these passes. Call the Amador Ranger Station for more information at 209-295-4251. 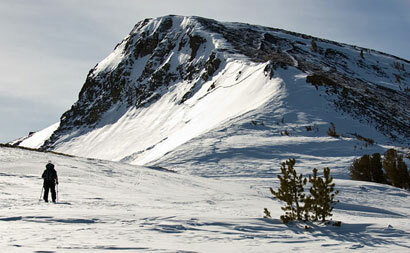 The eastern portion of the Mokelumne Wilderness is managed by the Carson Ranger District of the Humboldt-Toiyabe National Forest. Permits are available at trailheads on the Carson Ranger District: Ebbetts Pass, Wet Meadows, and Thornburg Canyon. Permits are also available at the Information Center in Markeeville, CA. These permits are not valid for the Carson Pass Management Area. If you are leaving from a trailhead on the Stanislaus (off of the Highway 4 corridor), you must pick up a permit from one of the Stanislaus National Forest offices (see sidebar for links to the Stanislaus site, office hours, locations, etc.). 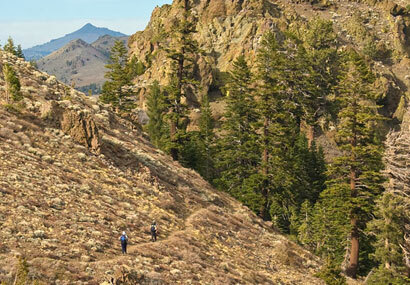 Long-distance hiking along the PCT usually requires planning many months in advance, as PCTA-issued permits and some Park and Forest Unit permits are limited. If you plan to conduct a hike along the PCT that begins on the Mokelumne and extends for more than 500 miles north, or past Tuolumne Meadows to the south, you will either need to obtain a permit from the Pacific Crest Trail Association or obtain permits covering all the National Park and National Forest Units you plan to travel through. 12 people for day trips, 8 people for overnight trips with the exception of specially permitted groups traveling the Pacific Crest Trail. Additionally, stock use is restricted to no more than 4 head and no more than two nights at Camp Irene and upper Hermit Valley. Black bears are increasingly common in the Mokelumne Wilderness, with individuals being displaced from the lower elevation western slopes into the higher country. Food must be stored properly at all times. Bear resistant food canisters are recommended. Use the bear section to learn more. Campfires are prohibited in the area from Carson Pass to Kirkwood Ski Area including Frog, Winnemucca, Round Top, Fourth of July, and Emigrant Lakes. In places where fires are allowed, please make sure that you use an established fire ring and only used dead and down wood. Check out the fire resource section for more info. Domestic pets are allowed in the Mokelumne Wilderness at this time. You are responsible for their actions as well as their welfare. In the Carson Pass Management Area pets should be leashed or physically restrained at all times. Elsewhere within the Wilderness, dogs should be either leashed or under direct voice control. Dogs can be injured by other dogs, stock animals, or wildlife. They can also disturb other campers or harm or harass wildlife. The Amador and Alpine County leash laws will be enforced inside the Wilderness boundary where dogs off leash are an impediment or hazard to the safety of any person, or where dogs are harassing or molesting wildlife. Camping is not permitted at Frog Lake to protect and promote the restoration of the shoreline. When there is a foot of snow on the ground you cam camp in the Carson Pass Management Area at a non-designated site except at Frog Lake, which is closed year-round to camping. Camping is not permitted within 100 feet of water, trails, or “no camping” postings within the Stanislaus’s portion of the Mokelumne Wilderness. Camping within 300 feet of Emigrant Lake is not permitted in order to protect and promote the restoration of the shoreline. A land of diversity, the Mokelumne sits astride the Sierra crest. From high alpine granite to volcanic formations, this world is truly where east meets west. Mokelumne Wilderness Volunteers Since 2004, a local group of wilderness advocates have been involved with the stewardship of the Mokelumne Wilderness in partnership with the US Forest Service out of the Amador Ranger District in Pioneer, CA. The help that they have provided over the years has been in the form of visitor contacts that represent the agency in its implementation of the Wilderness Act and providing information and advice regarding the wilderness’ resources and ‘Leave no Trace’ ethics. They also help in the maintenance of the trails, campsite restoration, administrative support, and being the additional eyes, ears, and presence that a 100,000 acre wilderness needs for its preservation.